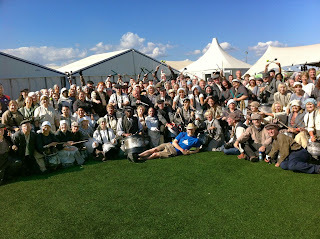 150 performers, an audience of 30,000 and a big rock stage: The Pandemonium Drummers, Working Men and Women, plus three Brunels remind an audience of predominantly London 2012 Volunteers of one of the highlights of the London 2012 Olympic Opening Ceremony on the site of the former Olympic Basketball Stadium on 19th July 2013. This was by far the biggest show ever for which I was responsible, filling the roles of Artistic Director, Choreographer, Producer, Music Editor and Stage Director. 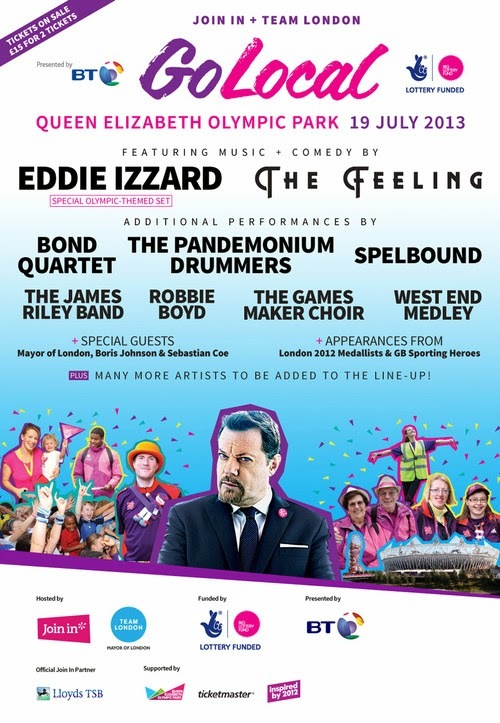 Go Local was a huge concert-style event hosted by Join In UK, the umbrella organisation for post London 2012 volunteering, and Team London, the Mayor of London's equivalent. 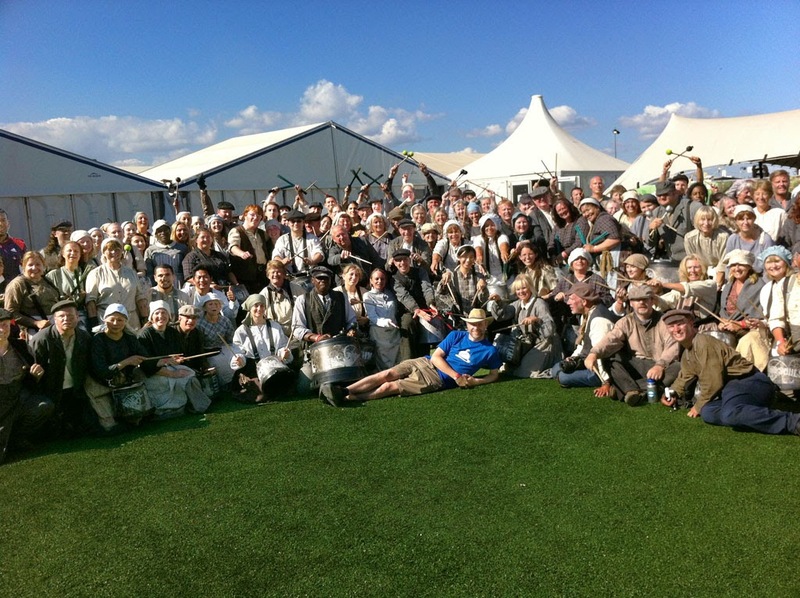 The Pandemonium Drummers were approached by Eleven 11 Events, the full-range producers of the event, who after short negotiations commissioned a Pandemonium Drummers appearance as the opening act of the main show. This was the Pandemonium Drummers' first commission of this kind, with a proper budget for organising rehearsals and contributions to volunteer travel costs - but the Pandemonium Drummers had to do everything by themselves! With my production experience, I was best placed to lead on this project. Based on an initial informal discussion, I produced a 25-page documentation that included a suggested choreography, performance timeline, rehearsal plans and a technical specification. The documentation formed the basis for a formal meeting with other members of the fast-growing project team, including the heads of the various functional areas, such as stage setup and sound, the latter managed by Britannia Row. We also met the latest recruit, who was taking over as the overall director of the event: Kim Gavin, Artistic Director of the London 2012 Olympic and Paralympic Closing Ceremonies. In the run-up to the show, I created extensive briefing materials, including a video animation for drummers to clarify visual signalling, a video animation for all performers to relay the plan for the choreography, and a video animation plus score for the skilled drummers - the overall documentation amounted to over 40 pages of written material, 15 minutes of video animation and nine versions of the sound track. On two very hot summer days, we held rehearsals at a place we knew well: In the Grade I listed House Mill and on Three Mills Green, right next to 3 Mills Studios, our initial rehearsal venue for the London 2012 Ceremonies. On Three Mills Green, we recreated a 1:1 layout of the stage and rehearsed stage entries and exits as well as performance-related choreographies to confirm timings, use of space, and visual aesthetics, while the time was also used to reacquaint drummers with the groove for the track And I Will Kiss. The day before the show, we were allowed onto the site of the real stage. Unfortunately, headliners McFly overran their rehearsal slot, so we never got an opportunity to rehearse with an active sound system; which caused a significant issue at the performance, as the PA sound drowned out much of the stage sound, including in-ear monitors - something we could only have spotted with an active PA system during rehearsals. However, we concentrated on blocking to work out the changes to my planned choreography: These were necessary because it turned out that 2x 10 metres of sidewing space was blocked by giant LCD screens and therefore not usable, and the space on the stage itself was severely reduced by various furniture for following acts. Effectively, the choreography had to be rewritten completely, which became my overnight job, to be done between leaving the compound at 10pm and returning at 8am the following day - Show Day. The original idea put forward by the event's producer was for a flash mob performance, starting with drumming in the audience and ending up on stage, but with a suggested performance time of just two and a half minutes, this was physically impossible. I obviously was keen on giving the drummers as much stage time as possible, but it had to make sense in the overall event, and our seven-minute proposal might have become boring after a while, so after several negotiations we settled for a 5'33" segment plus applause and a 20 second walk off reprise. Five skilled drummers would kick off the performance with an advanced drumming pattern, leading into the start of the song And I Will Kiss with a big entrance of 100 drummers. Some time into the performance, 40 Working Men and Women would charge forward through a gap in the middle with a visual choreography, ending up in the two front rows, kneeling down for a break in the music. This is where three Brunels would enter the stage from the sides and the back, walking slowly to meet up in the middle, and joining the Working Men and Women in the second part of their moves. The Working Men and Women were originally supposed to leave the main stage and go to the side wings, but due to their unavailability, they moved to the very back of the stage, while the drummers charged forward, creating a very powerful image. Brunels would do a double-time choreography, culminating in the final beat with lots of arm movement. After taking applause, all performers had only 20-30 seconds to clear the stage for the next act. The timeline below represents the show as it happened. In addition to my work, the e11 events team edited video footage and operated a live camera synchronised to our performance, and displayed on almost a dozen giant screens. Show Day started with an early morning rehearsal, unfortunately too early for the main PA, so again we could not replicate show conditions. The overnight changes to the choreography were trialled, and Kim Gavin was very helpful in optimising movements to achieve the biggest visual impact, however the changes also meant that not everybody would get a 'first row' experience as originally planned. All performers then had a long waiting time in anticipation of the show, partly filled with additional rehearsals; we shared our holding area with Spelbound and the Games Maker Choir. The heat meant that we tried to keep performers out of the direct sun as much as possible, because of the heavy Industrial Revolution costumes, although we could not prevent a 10-minute exposure just before entering the stage compound. The start of the main show, which we were opening, was delayed as the pre-show overran, so the performers spent almost half an hour lined up backstage, while the key performers and myself were professionally wired up with microphones and in-ear monitors. During the performance, I was equipped with in-ear monitors and a microphone to give directions to the five skilled drummers, four drum captains and three Brunels; the drum captains would signal groove changes to the 100 drummers visually, and the 40 Working Men and Women were cued visually by their own director, who was positioned in the photographer pit in front of the stage. I effectively talked throughout the 5'33" performance based on a script that I wrote after the morning rehearsal, although several off-script corrections were required, as the drummers lost their timing twice, largely because the stage sound was massively louder than during the rehearsals, so most performers could hear neither themselves nor my in-ear instructions. Despite the very difficult situation, the performance went on, and my corrections proved effective, resulting in only a few seconds of obvious difficulties from the audience viewpoint. Unfortunately, the planned pyrotechnics and CO2 cannons did not fire at the end of our performance for unknown reasons, though the atmosphere was pumped up enough. The reaction of the 30,000-strong crowd was overwhelming, and the choreographic concept of little surprises worked exceptionally well, triggering multiple cheers throughout the performance. While the audience was easy to please as they were mainly recruited from former Games Makers, London 2012 Ceremony Volunteers, London Ambassadors and other London 2012 staff and volunteers with their family and friends, the intensity of the reaction was still surprising, covering the full range of emotions: Ecstatic applause, hysteric cries and tears of joy. The excitement was matched by the performers, who thoroughly enjoyed the experience, and by our fellow performers in our holding area, who gave us a fantastic reception when we exited the stage compound. A few days after the performance, Join In announced that we were the most popular act - a nice achievement, considering that we were the only amateur act of the main show.